January 2012 Update: The store is now closed at this location. I have a new post about the new location in Permas Jaya. 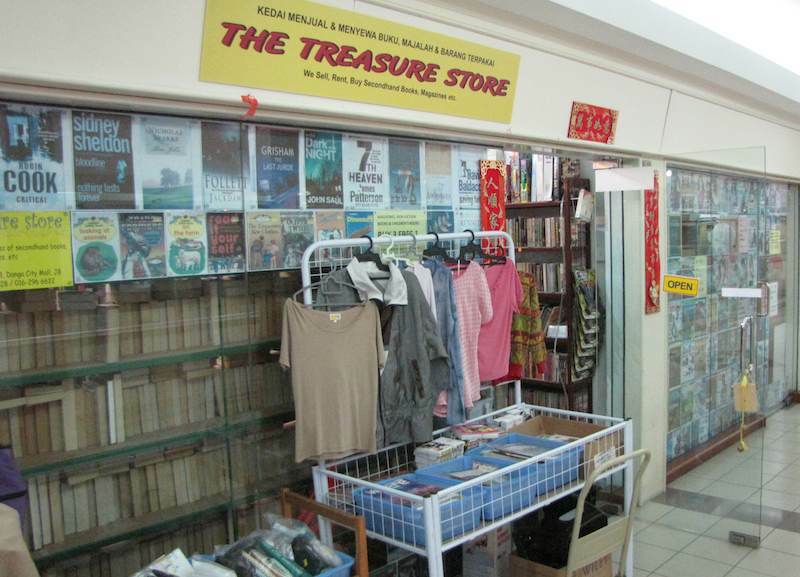 The Treasure store offers thousands of popular and rare used English language books at the Danga City Mall in downtown Johor Bahru, Malaysia. Malaysia (as well as Singapore) have very high book prices. 50-100% above those in the USA for the same books. While I was exploring I found this nice bookstore with a source of interesting reading: which was a very nice surprise. I was actually contemplating starting a used bookstore, if I couldn’t find one. The Danga City Mall seemed to have lots of available space (so I was thinking it might not be expensive) and for a good English language bookstore, I was thinking you might be able to draw customers (rather than relying on foot traffic – which seemed like it would be problematic). Even prices for used books are high in Malaysia and Singapore, as much as new books in the USA. Treasure Books has thousands of used books for sale and rent in English. Authors include: John Grisham, Michael Crichton, David Baldacci, Mary Higgins Clark, James Patterson, Ken Follet, Dan Brown, Danielle Steel… You pay the purchase price but when you return the book you will get a refund minus a 5 Ringgit (or so) rental fee. The owner is quite friendly and the inventory doesn’t fit in the shop so let her know if you have special requests. Also, I don’t think the store has regular hours, so you would be wise to call ahead and make sure it is open before making a trip. I was excited to find so many interesting books and hope we can make the store popular and keep in in business. 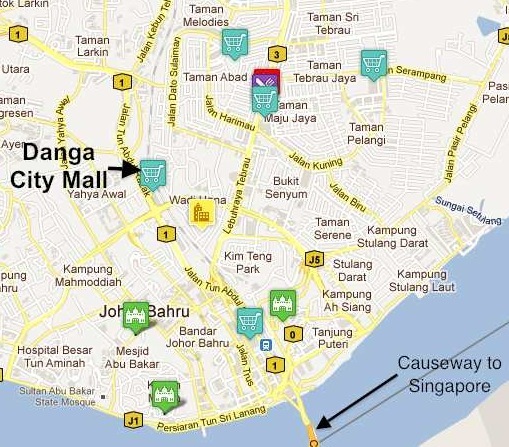 The Danga City Mall in general is nice but if you visit it is obvious the traffic needs to increase to sustain the existing stores and bring in more merchants (there are tens of empty store spots). The mall has a very good IT section with many stores and also has a bowling alley, paintball field and grocery store. I updated the theme for this blog and replaced the header image with one of floating houses in the straight between Johor Bahru and Singapore. Here is another photo from my visit in which you can see Singapore on the left and downtown Johor Bahru on the right of the background. It is hard to see in the image, but if you look closely you can also see the causeway connecting the two cities. 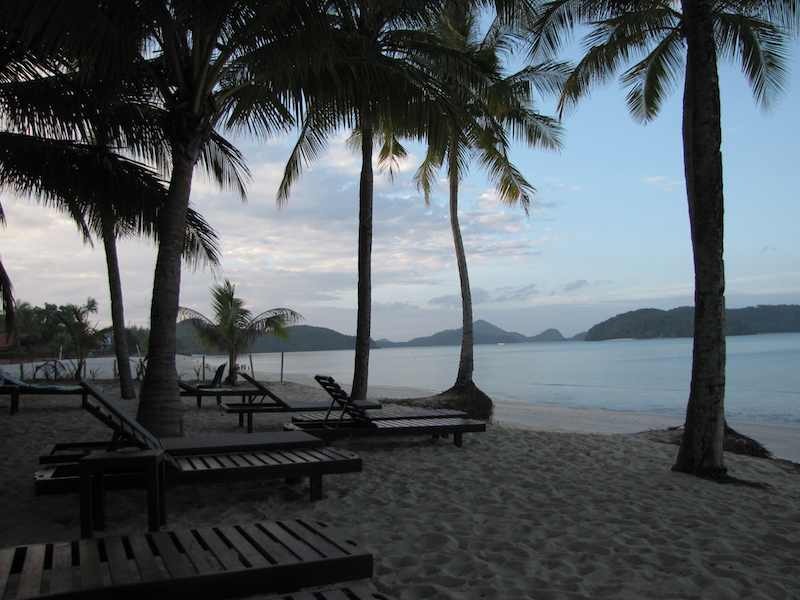 The photo is taken at the shore a few blocks from the Straights View Condos. 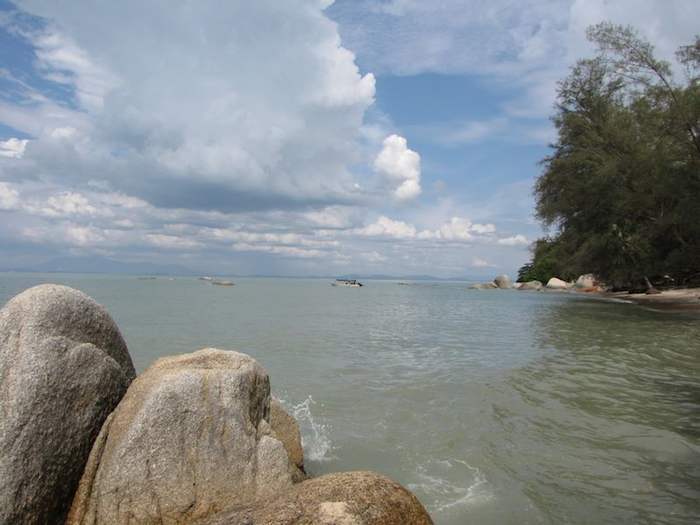 View of the straight between Johor Bahru and Singapore by John Hunter.